Highly satisfied with the quality and varieties available in a single combo. Also, the set is durable and easy to maintain. Highly recommended. Quality, designs, style, everything is amazing at such nominal price. 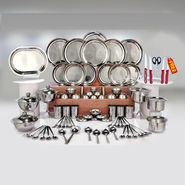 Ideal gifts during wedding, anniversaries or any other festive occasions. Great pick. Loved these wide varieties of utensils available at an affordable price.